The Lythell family name is this week’s Surname Saturday theme, focussing on Stretham and Little Downham in Cambridgeshire. The Lythell surname, which has many variants in Cambridgeshire during the 19th century, is this week’s ‘Surname Saturday’ theme focus. My most recent ancestor to carry this surname was my maternal Great x4 Grandmother Rebecca Lythell. She was born in about 1821 in the village of Stretham in Cambridgeshire, and was the third of at least five children to John Lythell and his wife (possibly his 2nd or 3rd wife) Frances Howard. This couple had five children between 1817 and 1827 (Sarah, William, my Rebecca, Eliza, Ann). Their daughter Rebecca, gave birth in 1840 to a son called William. She wasn’t married at the time, but soon married William Dewsbury of Stretham. William jnr adopts the Dewsbury surname at his baptism in 1842, taking Lythell to be his middle name. The newly-weds go on to have eleven children, with my Great x 3 grandmother being born in 1851. A few years earlier, Rebecca’s father John (c.1772-1830), appears in the Stretham baptism register with his daughter Alice in 1808, and her mother is noted as ‘Francess’. I’m guessing that this woman was probably my Gtx5 grandmother named above, and if it is, then this baptism occurs seven years before they married in 1815. Earlier still, John appears in the baptism register this time in 1806, where he is noted as the ‘reputed’ father of Elijah. Interestingly, Elijah is named as ‘Elijah Lithell’ (so confirming the surname when it’s only ‘reputed’) and there’s no mention of the mother’s name. Whether this was an earlier child with Frances, I will never know as his birth is far outside that of the certification. Either way, Elijah grew up to marry and raise his own family of ten children – but more about that in a moment. But, before all of this, John appears in the baptism register with his first wife Mary (Taylor of Soham, i think! ), and they bring five children into the church between 1791 and 1800 (William, Miles, Elizabeth, Thomas and Mary). Mary’s baptism in 1800 seems to be the earliest appearance of the modern spelling of the surname – ‘Lythell’. In total, John seemingly fathered at least twelve children from a potential 4 relationships. John’s own parents were John Lithell (bc.1746) and Mary Finch (bc.1748), and appear to have had eight children themselves between 1769 and 1788 in Stretham. John and Mary died within weeks of each other in 1814 and were both buried in Stretham church yard. In 1891, the main location for Lythell family groups is Cambridgeshire – claiming 67% (43) of the total 64 families noted on Ancestry.com’s analysis of the 1891 census. The nearest rival is Yorkshire, with 20% (13 families). Lythell name-bearers continue to live in modern-day Cambridgeshire. In the 18th century the surname certainly appears many times in Stretham, and a few times in nearby Little Thetford, Wicken, and Little Downham. 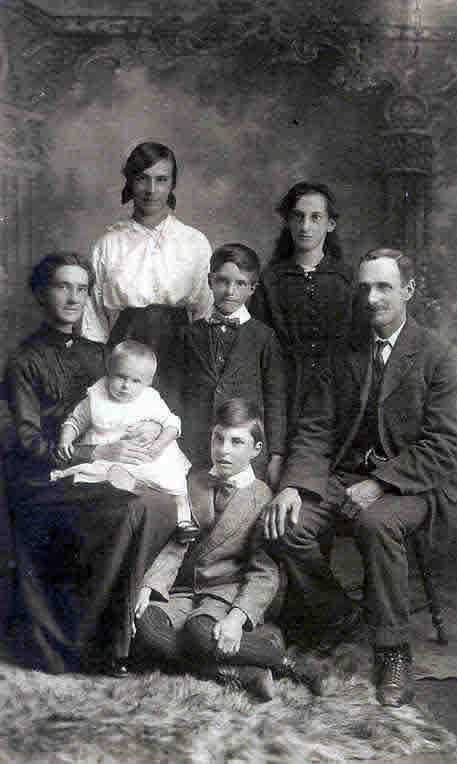 Rebecca Ann Martin (née Lythell) holds her son on the left of this family photo. Rebecca and her husband Walter (far right) are both my maternal and paternal relatives. A relationship loop has been caused – i’m calling it ‘The Lythell Loop’. The son of the illegitimate Elijah Lithell mentioned above, was named Murfitt Lythell. After marrying, Murfitt and his wife Mary had at least six children – the penultimate being a daughter named Rebecca Ann Lythell, born in 1879. Murfitt and his wife settle the family in Little Downham by 1881, and here is where Rebecca meets and marries Walter James Martin in 1901. The couple have six children, including one that’s partly named after her father – a James Murfitt Martin – although sadly he died at less than a year old in 1913. Walter James Martin was my paternal Great Grandfather’s older brother. So whilst the loop is not genetic (only via marriage), the many relationships of John Lithell would eventually become connected up. LYTHELL…seems like such a common name in UK but is quite rare here in the US…making it so hard to find relatives who know their ancestors. Do you know anything about a Rebecca Lythell Parsons, or a Sarah Lythell Moxon? Both are daughters of James b. 1816 d. 7 25 1897 and Mary ? b. 1819 d. 1 4 1889…both from Cambridgeshire? Hi Lynn, I’ll see what I can find. There’s a fair number of Lythell people around in the Ely area in the 19th century, and several still today. I’ll see what I can spot in the records.